Obituary of Sandhya L. Bose, wife to the late Dr. R.C. Bose. Mrs. Sandhya Bose died on June 11, 1989 at her home in Foulkeways at Gwynedd, PA. Mrs. Bose was born December 3, 1907 in India. It should be noted Mrs. Bose’s name is spelled incorrectly in the original document. Letter dated May 21, 1979 from Nani A. Palkhivala, Indian Ambassador to U.S., to Dr. R.C. Bose acknowledging Dr. Bose’s work in the sciences and inviting him to a dinner function to honor select high achieving Indian born scientists in the United States. Dr. Bose, who worked in the Department of Statistics at the University of Colorado, was also invited to make an address at the event. 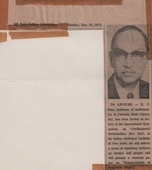 "Error-Proof Toll Line Code Developed By UNC Experts"
News article from Durham Morning Herald, Durham, NC, dated March 23, 1961, regarding Dr. R.C. Bose and his assistant, Dr. D. K. Chaudhuri. The two University of North Carolina - Chapel Hill professors developed an error-proof mathematical code for transmitting electronic data via toll telephone lines.